Purpose is at the intersection of what we are good at (STRENGTHS), what we love to do (PASSIONS), and the needs of who we serve. Based on this framework are nine important questions I always ask when clarifying purpose for clients’ projects. Why did you start your business? / Why do you do what you do? How does your offering benefit who you serve? Why do they have that need or want? 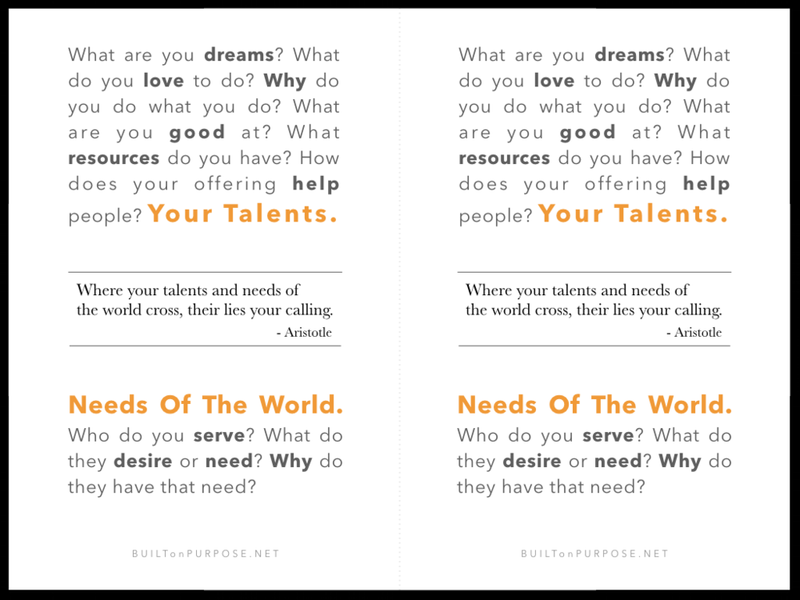 I’ve prepared a mini poster with these nine questions for you to stick on your wall, whiteboard, or fridge. It’s in PDF format and there are two copies of the poster on the page. Print it out, cut it in half, and share the other half with a friend or coworker.